A devastating and deceptively simple tale adapted from 10th-century folklore, Isao Takahata’s The Tale Of The Princess Kaguya distills a millennium of Japanese storytelling into a timeless film that feels both ancient and alive in equal measure. Arriving as the best animated movie of the year, but destined to be remembered as one of the revered Studio Ghibli’s finest achievements, Takahata’s first feature in 15 years delivers an emotional wallop on par with that of his 1988 masterpiece Grave Of The Fireflies. (Fans of that tearjerker will understand that the comparison is as much a warning as it is an endorsement). But whereas Fireflies found its way to the eyes by punching a hole through the heart, Takahata’s new film takes a less direct—and perhaps more deadly—approach, its astonishingly beautiful charcoal-and-watercolor design seducing viewers to lower their guard. By the time Kaguya is ready to strike, it has already rendered its audience defenseless; if this is Takahata’s final film, he’s determined to leave behind a few new scars. Arriving Stateside in both an English dubbed and a (superior) Japanese subtitled version, The Tale Of The Princess Kaguya is Studio Ghibli’s longest film, but it begins—as most folktales do—under a guise of extreme modesty. A humble bamboo cutter named Okina (translation: “old man”) happens upon a glowing stalk in the grove near his house. When he investigates, the shimmering tree blossoms reveal a baby nested inside. Believing this discovery to be a gift from the heavens, Okina brings her home to his wife Ouna (“old woman”), with whom he begins to raise the child as their own. Dubbing her “Princess” Kaguya, Ouna and Okina marvel at how rapidly the girl begins to grow, racing from infancy to pre-adolescence in a matter of days. 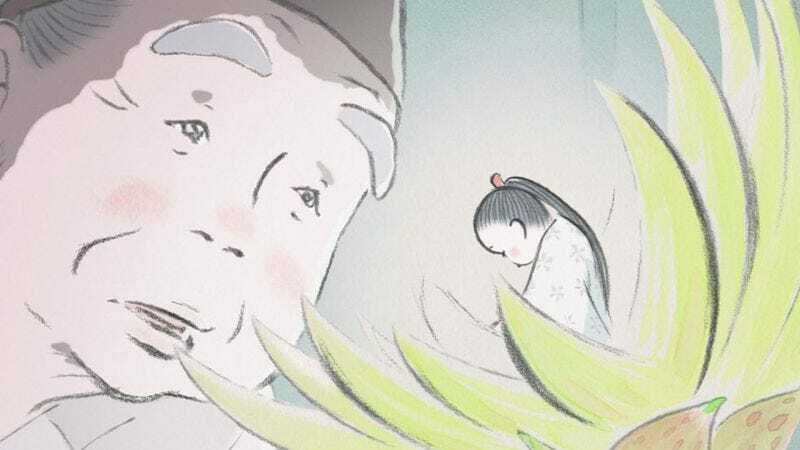 The Tale Of The Princess Kaguya is a film that matures alongside its heroine, a shrill prologue quickly giving way to some of the most beautifully expressive animation that Ghibli (or anyone else) has ever produced. Takahata may have been shorthanded due to the fact that most of Ghibli’s main staff was busy working on Hayao Miyazaki’s The Wind Rises, but together with animators Osamu Tanabe and Kazuo Oga, he’s created a stunning world. Kaguya’s Japan is spare and almost primitively painted, so that every line of charcoal or brush of color is rich with meaning. Many scenes are surrounded by an endless white void, as if the universe is so intensely focused on the character’s life that nothing else matters; this is her story, but it often feels told from a parents’-eye view. It’s that split perspective that allows the film to sustain its elegiac ambiguity, Takahata combining an almost unbearable urgency with the sense that Kaguya’s life is being mourned even as it’s still being lived. Takahata is careful to balance the male lust that drives the story with a broad humanism, alternately looking at Kaguya as a hyper-fetishized object and a young woman trapped by the callous dictums of the world. Even more so than the Ghibli films that have paved the way for it, The Tale Of The Princess Kaguya echoes with the sensitivities of Kenji Mizoguchi and Mikio Naruse, empathizing with its systematically objectified women. 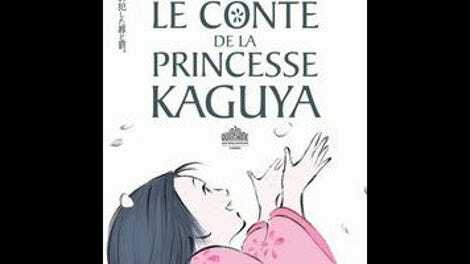 More earnest and sober than previous takes on this tale—like Kon Ichikawa’s whacked 1987 adaptation, the sci-fi-steeped Princess From The Moon—The Tale Of The Princess Kaguya may try the patience of American audiences weaned on the coked-out pacing of homegrown animated fare. All the same, the film’s drawings are almost peerlessly enchanting, and become downright irresistible when combined with the sounds of Joe Hisaishi’s woodsy requiems. And if The Tale Of The Princess Kaguya lacks the sweep and complexity to match The Wind Rises, the tender ambiguity of its telling—even after the shattering final reel—wounds in a similar way. The takeaway is palpable: Life is full of pain and sacrifice, some necessary and some needless. Loving the good stuff won’t make it last any longer, but it will make it easier to know what’s been lost. The Tale Of The Princess Kaguya won’t be the last Studio Ghibli film, but it tells the studio’s entire story.